Friday is Forgotten (or Overlooked) Book day, the weekly meme hosted by Patti Abbott at her blog, Pattinase. So don't forget to take a look at the books other bloggers are talking about today - the links are at Patti's. It's Agatha Christie Day today - plenty of books by the Grand Dame of the Golden Age to think about reading again or even, if you're a late bloomer, for the first time. 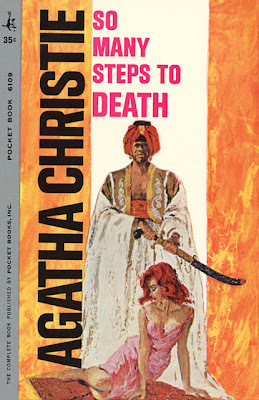 SO MANY STEPS TO DEATH (aka DESTINATION UNKNOWN) is a fascinating entry in Agatha Christie's long line of mysteries simply because it's not, technically, a whodunit except that it is. In the end, the 'whodunit' part is slipped in almost as an afterthought. Surprise! This is one of the few 'spy' thrillers written by Christie - books that work for me just as well as her more 'regular' fare. I am a Christie fanatic, so you can't really go by me, I'm bound to love her books, though of course I have my favorites. SO MANY STEPS TO DEATH is one of them. I've lost track of how many times I've read it over the years. It never fails to capture my imagination. Hilary Craven is a young English woman whose child has died and whose husband, tired of the unending grief, has left for greener pastures. On the eve of his re-marriage, she flies off to Casablanca, thinking escape. But when there's a mix-up in schedules and she is bumped onto another plane "You will arrive three hours later, that is all, Madame, on the later service." But when the original plane takes off without her only to crash in the desert, we see that fate has stepped in to divert Hilary's path. She bemoans the fact that she wasn't on the doomed plane for then her troubles would be over and she'd be at peace. Landing in Morocco, Hilary determines to kill herself for the unhappy truth of the matter is, no matter where you go, you take your troubles with you. She is just as miserable in sunny Morocco as she was back in rainy London. So off she goes to buy drugs. "Hilary had always imagined that drugs were easy to buy in foreign cities. Rather to her surprise, she found that this was not so." As she goes from pharmacy to pharmacy buying enough sleeping powder to do the job correctly but not to attract too much attention - Hillary does, in fact, come to the attention of Mr. Jessop, an 'owlish' young man buying toothpaste. He follows her to her hotel room and breaks in just as she's putting the finishing touches on her dramatic exit tableau. To Hilary's astonishment he then proceeds to offer her an alternative way out of her misery. The plot is this: A group of brilliant scientists around the world have been disappearing from their lives and governments are interested to find out the why and wherefore. In this case, the British government wants to know if physicist Thomas Betterton (supposedly dead in a plane crash - there are several fortuitous plane crashes in this book) is actually dead and if not, where the heck is he? Has he joined the other missing scientists somewhere? Behind the Iron Curtain is a doubtful destination for several reasons and searches made world-wide have turned up only the vague information that something sinister may be afoot. A plot to take over the world? Hey, it was the 1950's - no plot seemed too grandiose. And what does all this have to do with Hillary Craven? Well, turns out that Mrs. Thomas Betterton (the missing physicists' beautiful red-headed wife) is being watched for any signs of contact from her hubby. When she suddenly decides to take a trip abroad, the men in the Intelligence Service, i.e. Mr. Jessop (who have been watching and monitoring her) figure that maybe she is headed to meet her husband. But wait. Come to find out, a few days later, Mrs. Betterton is one of the passengers in the doomed plane crash. The same plane Hillary would have been on had she not been bumped. Are you getting a glimmer now? Yes, Hilary has brilliant red hair, same as Mrs. Betterton. Is she willing to take on an assignment from Mr. Jessop and the powers that be, that requires her to impersonate Mrs. Betterton going to join her husband heaven knows where? Mr. Jessop and his minions will try and follow Hillary as she continues her trip (pretending to have survived the crash) and perhaps, rescue her in the nick of time. Maybe. Once she arrives she will, most undoubtedly be unmasked and killed, but that shouldn't matter much to her. Right? Only Agatha Christie could come up with a plot like this. What I like best is watching Hilary's gumption return, watching her dormant will to live come back to life. As the adventure deepens and friend and foe become indivisible, she is called upon to use her wits and bravado to help put an end to the most outlandish of plots thought up by a billionaire with a fiendishly clever mind and the money to indulge it. A terrific book. And as I said, at the end, there is the surprise that makes you realize you were reading a 'whodunit' all along and didn't know it. I've not actually read this one (or DESTINATION UNKNOWN either as it is aka'd here in the UK) but I shall consider myself intrigued after you write-up -thanks Yvette. I should say (I think I should ...) that I'm not usually a fan of the Christie adventure/thriller/espionage titles but if you say it's good ... If nothing else, the UK title will be prophetic in my case! This sounds great. I can't recall having read it before, but perhaps I saw it mentioned on a Christie documentary sometime. Something about it, the Cold War spy element perhaps, sounds vaguely familiar. Yvette, good choice, good review! The moment I saw the cover I thought you'd written about a Christie novel I'd never heard of and then I saw the words DESTINATION UNKNOWN and I was glad to see it among my AC collection. I'm going to have to read this one quickly to find out how Christie handles espionage considering I didn't give her much credit for her first effort at a spy story in THE SECRET ADVERSARY. Hopefully, SO MANY STEPS TO DEATH will make me change my mind. By the way, that is a fantastic cover. I enjoy it every time I read it, Sergio. It is just SO improbable, so preposterous. But hey, life is full of strange doings. The most fun is figuring out how the whole thing will be resolved. Christie was a wizard. Jacqueline, she wrote a couple of books with Cold War themes during the 50's, i.e. PASSENGER TO FRANKFURT which no one seems to like much. I like it though it's not great Christie. It is even more preposterous than SO MANY STEPS TO DEATH, which is much better. Oops, just double-checked, Jacqueline. PASSENGER TO FRANKFURT was published in 1970. Sorry about that. But it is still one of Christies' 'spy thrillers'. It's got a mad scheme by latent Nazis sympathizers to take over the world. Fun. The truth is, the more I read this book, the more clever I think Christie was in fashioning it. If you read it, I hope you'll write about it. I don't really like espionage thrillers but I quite enjoyed this one (not the end though). Your review is so enjoyable, it has made me want to pick it up once again. Thanks. Harrumph, Yvette - a Christie that I may not have read! It's not on my shelves, at any rate, so I guess I'll have to get a copy. What, ANOTHER TBR? By the way, Mark Campbell, in his invaluable "Agatha Christie" book in the "Pocket Essential Literature" series says that "Destination Unknown" was based on two 1950s physicists - Bruno Pontecorvo and Emil Fuchs - "who betrayed their countries." This is not one I've read before, so I'm really looking forward to it now. You're welcome, Neer. I didn't mind the ending, preposterous as it was. 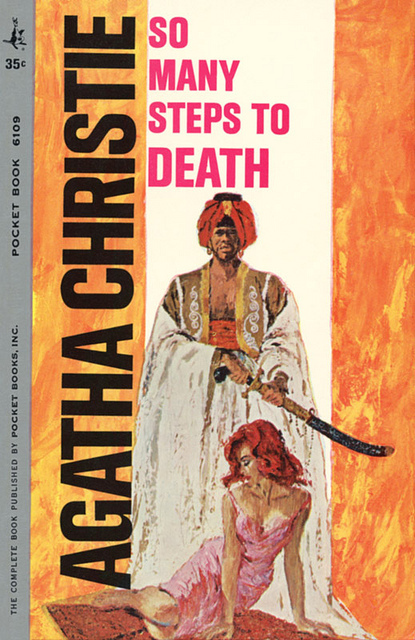 One of my favorite Christie books. Interesting to know that real life doings influenced Christie in writing this one. Well, I have a suspicion she paid a great deal of attention to the changing world and fashioned her mysteries accordingly. You're in for a treat, Ryan!